President Dr Mohamed Waheed has told local media he was not aware of any danger posed by the presence in the Maldives of two Armenian nationals identified as the Artur brothers, as police continue to investigate the duo’s operations locally. Controversy has surrounded the presence of Margaryan and Sargayan Artur in the Maldives, primarily based around concerns over their alleged links to criminal activities in Kenya. On Tuesday (April 2), parliament passed an extraordinary motion concerning the presence of the two foreign nationals in the Maldives, expressing concern that an alleged connection between certain cabinet ministers and the two men posed a “direct threat to national security”. The President’s Office has maintained there is little information about the nature of the two foreign nationals’ business interests in the Maldives, claiming that the uncertainty about them extended to the exact pronunciation of the Artur name. Asked about the controversy today, President Waheed told reporters he received no intelligence so far linking the Artur brothers to any criminal activity in the country, adding that much of his knowledge on them was based on local media reports. “I know that they are in Maldives. I’m also looking into it,” he was quoted he told local media after returning to Male’ from an official visit to Kuwait. “I didn’t know that they were engaged in any illegal activities,” President Waheed stated, after admitting the government were told by authorities of the brother’s presence in the country earlier this year. President’s Office Spokesperson Masood Imad said that while police were currently in the process of investigating the activities of the Artur brothers in the Maldives, there was no information linking the two foreign nationals to any criminal operations in the country. Police spokesperson Hassan Haneef told Minivan News that police investigations were continuing to determine if the two foreign nationals had been conducting any illegal activities in the country. He added that no details into a “critical” ongoing case could be given at present. However, a BMW car belonging to a company called ‘Artur Brother World Connection’ and registered for use in the Gaafu Dhaalu area was reportedly seized by authorities in Male’ today. Haneef previously confirmed that police were aware of the Artur brothers presence in the Maldives back in January. He said authorities had contacted “relevant government authorities” at the time to inform them of the Artur brothers’ alleged links to drug trafficking, money laundering, raids on media outlets, dealings with senior government officials and other serious crimes in Kenya. Minivan News understands that relevant authorities, including the Maldives National Defense Force (MNDF), Ministry of Home Affairs, and the President’s Office were officially informed in January of the presence of the Artur brothers, even as Tourism Minister Ahmed Adheeb signed a letter seeking residency permits for the pair. Local media reported that a company registered locally as the “Artur Brothers World Connection” has secured an import license and brought goods into the country after the tourism ministry had granted both men a foreign investment permit. “We have learned that they had imported some goods under that license. We haven’t been able to determine what those items are. It is not something the Ministry keeps track of. We have to find that out from the customs,” Finance Minister Ahmed Mohamed told Haveeru. Immigration Controller Mohamed Ali has previously told local media that Artur Sargasyan left the Maldives on Sunday (March 31). Sargasyan first entered the Maldives on a tourist visa in August 2012 and returned again in October, Dr Ali said. Meanwhile, photos of the Arturs in the company of Tourism Minister Ahmed Adheeb and Defense Minister Mohamed Nazim emerged on social media last weekend, apparently taken during the Piston Motor Racing Challenge held on Hulhumale’ between January 25 and 26. 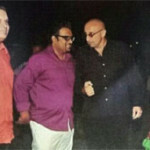 One photo showed Artur Sargsyan next to Adheeb and Nazim, while another has him apparently starting one of the motorcycle races at the event, which was organised by the Maldivian National Defence Force (MNDF). Another image showed Sargsyan at the red carpet opening for the Olympus Cinema. Defense Minister Nazim and Tourism Minister Adheeb have denied any involvement with the pair. Speaking to Minivan News this week, Adheeb reiterated that he had no personal links with the Artur brothers, whom he said had now left the country on his recommendation. According to Adheeb, the Artur brothers had previously invested in the country through a registered joint venture company with members of the opposition Maldivian Democratic Party (MDP). Submitting a motion to parliament on Tuesday about the Artur’s presence in the Maldives, opposition Maldivian Democratic Party (MDP) MP Imthiyaz Fahmy raised concerns about their alleged connections with ministers Nazim and Adheeb. “The Artur brothers are a direct threat to national security since they are – true to their old style and from the experiences of other countries – directly linked to the top government officials including Mr Mohamed Nazim who is both the Defense Minister and the acting Transport Minister, as well as Mr Ahmed Adheeb who is the Tourism Minister,” Fahmy told Minivan News. “Given all these facts – and that the Artur brothers are world-infamous for carrying out criminal activities of this sort – they were allowed into the country and seen publicly with top government officials,” Fahmy added, alleging that the pair have three meetings with Adheeb and Nazim on Hulhumale’ and on Club Faru. The extraordinary motion passed with 27 votes in favour to 10 against. Meanwhile, Kenyan media has this week media reported that the brothers’ practice of publicly ingratiating themselves with senior government officials appeared not to have changed. “The Arturs’ mode of operation where they show up in the company of top and well-connected government leaders appears to have been replicated in the Maldives. Their presence in the Maldives comes days after ousted leader Mohammed Nasheed expressed fear over his life,” reported Kenya’s Daily Nation publication. Perhaps it is not a business of the President to be aware of things. Things happen and he is there. What can he do. Perhaps its Gods will. President, not knowing the criminals!??bull? All of the politicians must have known about them including Nasheed? It's what all politicians do?? let the criminals do the work and blame each other for doing it??! We are not dumb!!? All of the politicians must have known about them including Nasheed? It's what all politicians do?? let the criminals do the work and blame each other for doing it??! We are not dumb! no.... It means that he is in cahoots with the conmen criminals!! Deny, Deny, Deny. Waheed knew nothing on 7th Feb 2012, knew nothing about Artur Brothers. Arturs brothers given import license under a foreign investment company in Maldives and the goods that they import are cars, car parts and attempts to import goats into the country? The pressing concern and question here is how could ministry of trade and economic development issue a license to import these goods to a company which foreigners own a majority. Will they also start importing other consumer products into Male'. If the traitor Waheed, was not made aware of this, by those who should be supplying him with all information regarding any threat to the nation, criminal, security or otherwise the Ministers of Defence and Home Affairs are sleeping on their jobs, or they are a part of this! If the traitor Waheed, does not fire Ministers and those who visibly and invisibly were involved in this criminal affair with immediate effect (including the Tourism Minister, Customs Chief and his own brother), there can be not a speck of doubt that he is a part of this criminal package! And if this traitor, Waheed is a part and parcel of this criminal package; surely it should concern the US also! And if these people are not put on trial; None of the people of this country should face trial for whatsoever reason! Yeah yeah John, It's also god's will that you are with coo BMW and Artur brothers, isn't it? Blame god now. Come on buddy, Dr.Waheed! What the hell are you talking? You know Adeeb is a gangster. Like I said, it is not a business of the Maldivain President to be aware of things. Where is it written in Presidents Job description? Go to court and prove it? I met the Arturs some time back in Male', I did not know it was artur or joseph or whoever, i saw him as a foreigner here in maldives trying to enjoy a vacation.. some few weeks later i come across the media tabloids and word 'danger' associated with them.. but from the inside information i have, artur's came to maldives on a different purpose. not to kill anni... they had teamed wth top govt officials which is true to being their regular operation procedure. the violence started because maldivians didnt want to let a foreigner behave as they wish or hit a local and escape... having said that, even i cant say their business intentions changed over the past few weeks.maybe now they r willing or want to come after anni after all the trouble they went through. it changed to a political story.. only to hide the real truth behind the black curtain operations. When the Customs officially informed Mr. Naazim of t he Artur Brothers involvements in illegal activities and breaches of law, without expelling them for overstaying in Maldives, Mr. Ministers extended the visa for them to stay. That too for 5 years. 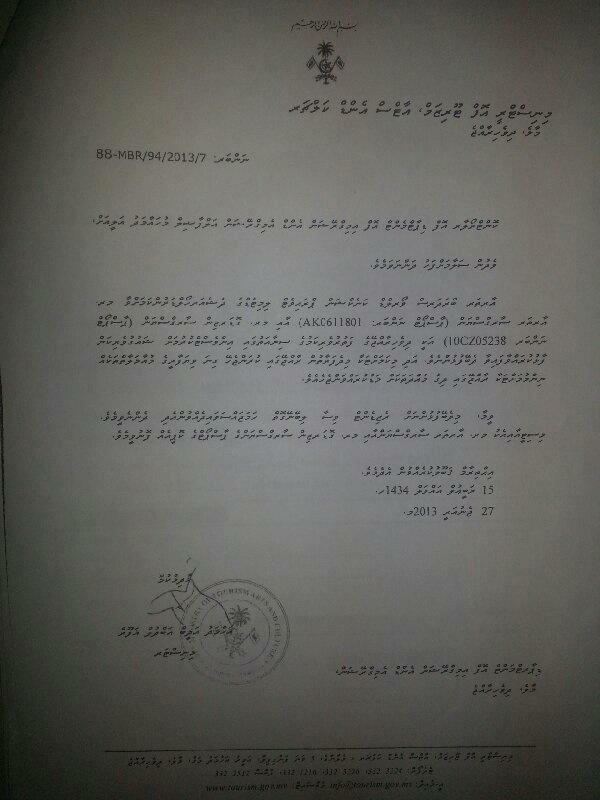 Clearly Mr. Naazim knew about illegal dealings that were conducted in Maldives by the Artur Bros. Does he claim he was not aware of the case of the 75 goats? Does he not know of the BMW Car? Does he not know that Tourism does not include selling ice in GDh? ... Adheeb, do you have to provide safe passage to criminals and gangsters by extending visa for overstay ? Is Baaghee Waheedhu Maniku aware that he is the Illegally appointed President of Maldives. that he know how to touch type by using just one key. All Foreigners and Local investors be very aware, any agreement this illegal government enters is void and not legally binding or enforceable. Please do not enter into any agreement with this illegal government to invest in Maldives. Waheed met them in Dubai and now Kuwait media is reporting that he met these gangsters in Maldives as well. Does this president know that there is a country called Maldives. A stupid graduate from Stanford University. It is better to send this guy to a doctor and check whether he is mentally fit or not. Very true. No better words to comment as you did. What a Stanford graduate! Company act does not require to check the background of shareholder and so does these people. The problem lies with the constitution and company act need to be changed to avoid this kind of drug loads getting thier feet set in Maldives. People can blame anyone and the country is in a big mess due to previous government. These people were even brought by MDP activist in then first place. Think it over and digest the realities. “I know that they are in Maldives. I’m also looking into it,” so said Mr Waheed. Right said Fred. This is the state of this regime! The conmen cannot even agree on a common story. Lies, lies and more lies. With the will of Allah, the traitors shall face justice, soon. Maumoon brothers,Waheed brothers and Artur brothers.? Is Dr Waheed so naive? If so he should step down from his present post taking charge of running a country. Why can’ t you Sir browse the internet and get to know the famous Arthur brothers. Do you think we are more wise then the Kenyan Parliament and the Kenyan authorities? What a joke. Stop day dreaming and wake up. Maldivians cannot be hooked with lies any more. The Arthur brothers are so powerful they attended and participated as a key player in the piston race and went to Olympus on their own. The power of money!!! !Waheed stop lying! If there is an attempt on Mr. Nasheed's life, the police and President Dr Mohamed Waheed should be blamed. They made the coup and it would benefit them to murder the rightful elected president and they know now - even if they pretended not to know before. Be warned Mr. Waheed the world is watching you - do not add murder to the list of your deeds!